The Friends of the Haslett Library Board meets every month. Date, time & location varies. 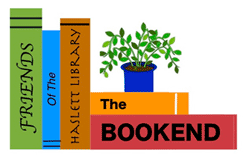 The BOOKEND, the Friends of the Haslett Library's used book store, is located in the Friends Room of the Haslett Library (click for directions). Monday 12 to 4 p.m.
Tuesday 12 to 4 p.m.
Wednesday 12 to 4 p.m.
Thursday 12 to 6 p.m.
Friday 12 to 4 p.m.
Saturday 12 to 2 p.m. The BOOKEND accepts donations of materials in gently used condition. Donations may be dropped off at the Haslett Library circulation desk, 1590 Franklin Street, during library open hours.